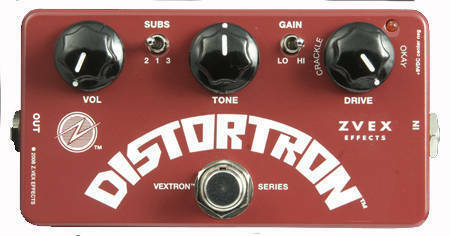 The Distortron is the gifted little sister to the Z.Vex "Box of Rock". It is highly specialized to simulate the "everything on 10" sound of a classic Marshall JTM45 non-master-volume amplifier. You may use the Distortron effectively with many different amplifiers, but to get the sound I heard when I designed it, try it through an old-school non-master volume control Marshall at least once. You may use your guitar's volume control to adjust for the exact amount of distortion you need, all the way down to very clean and clear with most drive settings when the gain switch is set to "Lo". Forget using this as a distortion pedal. This thing is fantastic as a low-gain/dynamic drive pedal. I use it with a tweed bassman and the tone doesn't change. It just becomes more distorted the harder I play. I leave it on all the time. It has become essential to my rig. Just the perfect heavy OD pedal !! not the fizzy dry sound everyone thinks of when you use the word distortion. Maybe that's why it's called "Distortron" ! If you love that heavy Marshall tone cranked then get this ! Clean up just amazing with the guitar volume. I would own two if there was any advantage to it LOL ! !